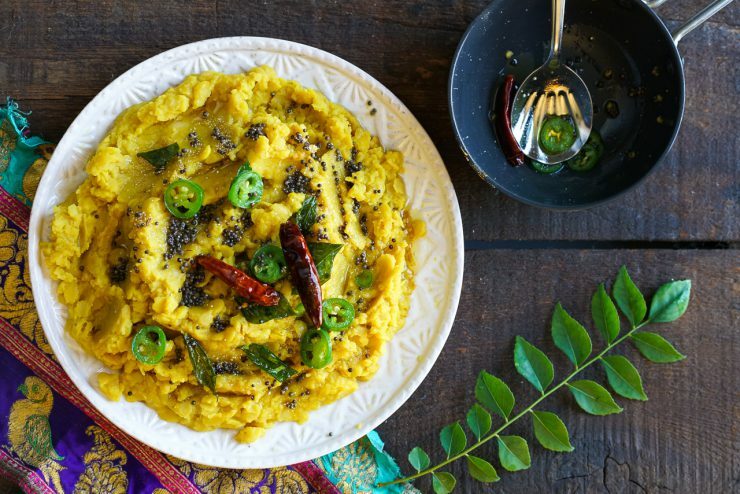 Lachko dal is a hearty Gujarati comfort food. It is no surprise why. Lachko dal is full of flavor and has an extraordinarily creamy texture. 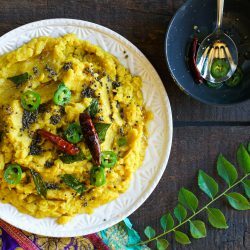 This lentil dish is also super easy to make, versatile enough to be eaten with rice or paratha, freezes well and is a perfect food for babies. My mom taught me to make this using a pressure cooker, so I took the family recipe and turned it into an Instant Pot dish. Lachko Dal was one of the first solid foods we introduced to our son. At first, for the first few weeks, he was only interested in playing with his food (which was fine with me – he was nursing for nutrition so I wasn’t worried about him getting enough food). Then, he slowly started tasting a bit of this or that, but still mostly playing with his food. Finally, around 8 months of age he began to really eat. He loved to eat this lachko dal. He tasted it a bit with his spoon, then started eating (and painting, because that always happens. You just have to embrace the mess!) with his fingers, and loved it so much that it ended with his face in his plate trying to consume as much of the dal as possible! Dal and other lentils and beans remain favorites for my little one, and he continues to enjoy the lachko dal! I’m so happy to see him enjoying this family recipe. Be sure to check out the recipe for Osaman as well as these two recipes go hand in hand. 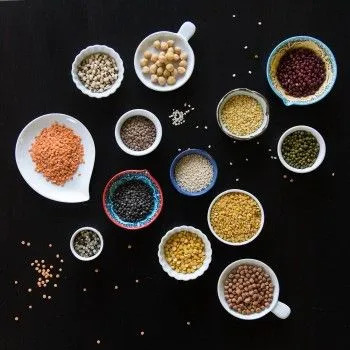 And if you are interested in cooking different types of lentils and beans, check out my Guide to Indian Dal, Lentils, Beans, and Pulses. What do you serve Lachko Dal with? 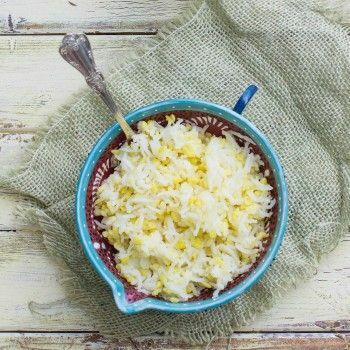 Traditionally lachko dal is served with plain basmati rice and Osaman. But it is also perfect with flat breads. 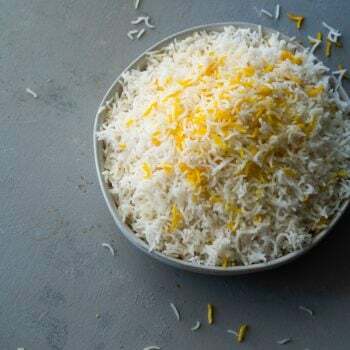 Try it with paratha or these gluten free rice flour rotli. 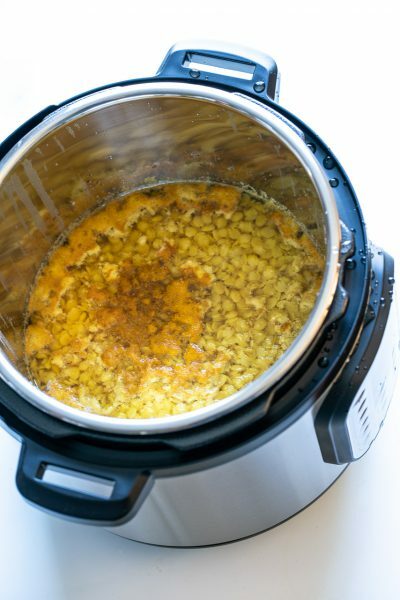 Combine the pigeon peas and turmeric with 6 cups of water (use 3 cups if not making Osaman) in an Instant Pot or pressure cooker. Using a large sieve, strain the dal mixture. Set the liquid aside to make Osaman. Transfer the solids to a medium sized bowl. This is your lachko dal. Heat a small pan with the ghee added for the vaghaar (also known as tempering or tadka). 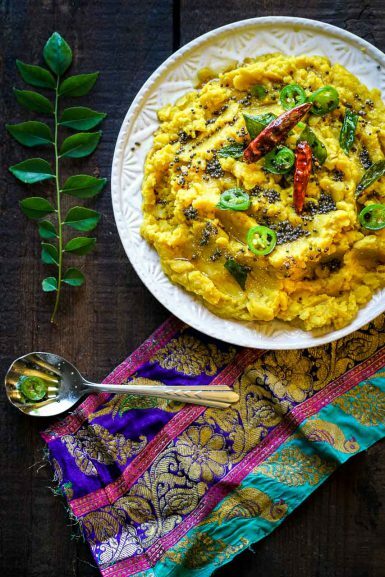 Once the ghee is hot, add in the mustard seeds, asafoetida dried red chili, curry leaves and sliced green chili. Stir for about 30 seconds or until the curry leaves turn dark green. Pour three quarters of the spiced ghee over the dal solids, add salt and stir. Garnish with the remaining ghee mixture and serve warm. Comments on "Lachko Dal: Hearty Pigeon-Pea Stew"